PC power supplies, also known as computer power supplies, are pieces of hardware which convert high-power mains electricity into usable DC power, for the components within your desktop computer. They convert AC (alternating current) from the mains to low-voltage, regulated DC (direct current). Why use a PC power supply? Power supply units (PSUs) are an essential piece of hardware within a computer as they supply power to all the components within your PC, such as the motherboard or graphics card. Typical PSU voltages are 3.3V, 5V and 12V. PSUs are there to prevent spikes in the voltage supply and for surge protection. You will find these power supplies in the back of a desktop computer. It is an internal hardware component. Computer power supplies feature a power cable connector on one side and multiple wires on the other. These wires connect to various devices within the computer to supply power to them, for example, motherboards and hard drives. Computer power supplies also have a cooling fan which expels air out the back of a computer. They also prevent overheating through voltage control. There is usually a power switch at the back and another switch to alter the voltage. How important is overall wattage? It is important that you computer PSU covers the necessary wattage that your system requires. You can work this out by roughly adding up the consumption of all your parts. 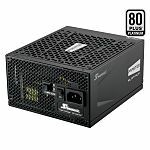 It is best to have an oversized PSU as it will cover your current wattage requirements, with room for extra if you decide to upgrade any of your components. What is an ATX PSU? ATX is a specification for motherboards which many PC power supplies meet. This means that the computer PSU fits into an ATX standard case and works alongside an ATX motherboard within the PC. An ATX power supply would be suitable for use in a modular computer as it has a standard case size.